Cara wanted to go to the circus. Ever since she'd heard it was in town, she'd pestered her mama and papa to take her. Cara's little brother, Drew, wanted to go too. One afternoon Mama and Papa agreed to take them. They drove to the circus. Drew didn't say a word. He didn't smile, but stared at the big tent. “Mama, I think Drew is happy to be here. Let's buy him a balloon and go inside. Can I have some cotton candy?” Cara took her papa's hand. “You can have some cotton candy, Cara, but not too much. 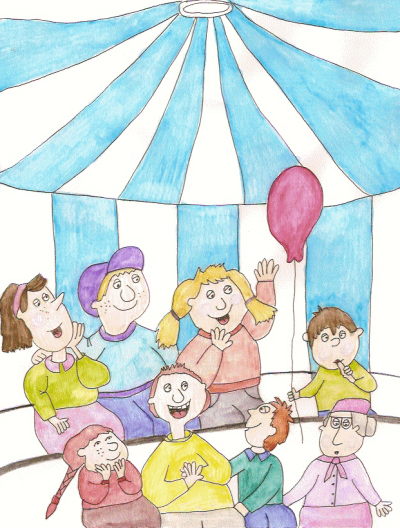 Let's find a good seat and watch the circus.” Mama led them inside the tent. They found a good seat near the front. Mama sat next to Papa. Cara sat on the other side of Papa and Drew sat next to his sister. He held a red balloon in his hand and sucked his thumb. The clowns heard her and ran over to her. Drew saw the brightly colored clowns with big red noses and huge feet. He started to cry. “Mama! Papa!” He ran to his mama and climbed on her lap. “I don't think Drew likes the clowns.” Mama hugged her son. One of the clowns spoke to Cara and told her to sniff his flower. When she did, he squirted her in the face. Water splashed all over. Cara wiped her face off and started to cry. “Mama! Papa!” She climbed on her papa's lap. “I don't think Cara likes the clowns either,” Papa said. The clowns ran around the tent, throwing balls in the air and making faces. Sometimes they honked a horn. Cara and Drew didn't move. They buried their faces in their mama and papa's shoulders and cried. Mama thought it was best if they went home. Cara peeked. She thought he was going to squirt her in the face again and quickly hid herself. “I won't squirt you. I'm sorry. I brought you some popcorn,” the clown said. Cara lifted her head and looked. The clown had a big smile painted on his face. She reached for the popcorn and took it. “Thank you.” She sat on her papa's lap and nibbled popcorn. She wasn't afraid any more. “Little boy, I've got a present for you too,” the clown said. “In his hand he held a dozen balloons. Drew peeked and saw all the balloons. He reached for them and took them from the clown's hand. He smiled at the clown. “I didn't mean to scare you. Clowns are nice.” The clown ran off. Cara and Drew laughed during the entire circus. They weren't afraid any longer. When the clowns came walking by, they clapped and waved. Mama and Papa were relieved. Every time the circus came to town, Cara and Drew wanted to go. Mama and Papa gladly took them, knowing they'd have a fun time there together.